November 2, 2018 – Shamila Balkis Zawahir, MD, a pediatric gastroenterologist, has joined the Englewood Health Physician Network and Englewood Hospital and welcomes new patients to her practice located in the medical suites at Englewood Hospital. Her areas of clinical expertise include celiac disease, chronic abdominal pain, constipation, gastroesophageal reflux disease, gastrointestinal bleeding, hepatitis, inflammatory bowel disease and irritable bowel syndrome, nutrition disorders and food allergies. 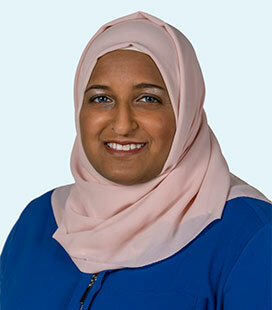 Dr. Zawahir is board certified in pediatric gastroenterology. She received her MBBS from Sri Ramachandra University in Chennai, India, and did her residency in general pediatrics at Harlem Hospital Center (an affiliate of Columbia University College of Physicians and Surgeons), where she was chief resident, and a pediatric gastroenterology and nutrition fellowship at University of Maryland Children’s Hospital. In addition to Englewood Health, Dr. Zawahir is a consulting pediatric gastroenterologist at S.A.I.L at Ferncliff Manor, a residential school for children with developmental disabilities, in Yonkers, NY. She was previously director of the pediatric endoscopy and motility unit at University of Maryland Children’s Hospital and an assistant professor of pediatrics at University of Maryland School of Medicine, as well as director of the fellowship program in pediatric gastroenterology. Dr. Zawahir is skilled in a wide range of diagnostic and treatment procedures, including upper endoscopy, colonoscopy, video capsule endoscopy, liver biopsy, polyp removal and motility procedures. She is a co-author on a number of book chapters and journal articles on gastrointestinal disorders in children, has been the recipient of a National Institutes of Health grant researching neonatal bowel inflammation, and has lectured at area hospitals on inflammatory bowel disease and celiac disease in children. Her practice philosophy includes incorporating both traditional and integrative medicine to promote optimal clinical outcomes, including using nutrition as a pathway to health.